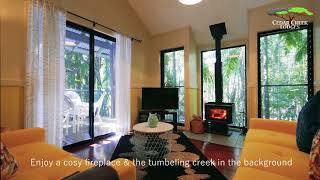 Cedar Creek Lodges shares a magnificent rainforest property with Thunderbird Park on Tamborine Mountain - under an hour from Brisbane and the Gold Coast. 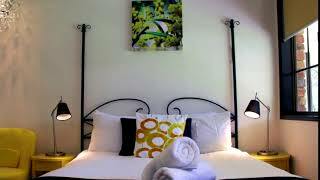 Stay in a stylish two bedroom Creek Lodge or a family holiday home or choose a contemporary room with or without a spa. For adventure junkies: adrenalin highs await on the Canyon Flyer Guided Zipline Tour and TreeTop Challenge. Then there's other fun activities of thunderegg and crystal fossicking, laser skirmish games in the rainforest battlefield, horse trail rides, the championship mini golf course and daily bird feeding. Enjoy a hearty barbecue breakfast with the birds, chill out on the Terrace or dine in style in the Rainforest Restaurant and Lounge Bar. The seasonal menu has been created by award-winning chef, Luke Turner, using the best of the farm-fresh produce from the local fertile Scenic Rim farmlands. The Terrace serves light meals and snacks all day every day, homemade pizza from the wood-fired oven is a specialty. Tours to local wineries, waterfalls and markets are also available by booking the Thunderbird Park Escape Shuttle. Cedar Creek Lodges is the ideal destination for family holidays, romantic escapes, conferences and weddings. The Creek Lodges are self-contained two bedroom stylish and architecturally designed lodges nestled along the banks of beautiful Cedar Creek. 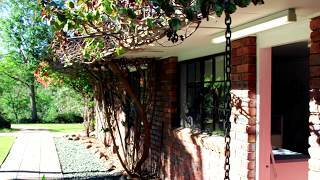 Mill Lodge is a refurbished roomy 1980's four-bedroom brick house situated on the banks of Cedar Creek. It features an open brick fireplace and two bathrooms. 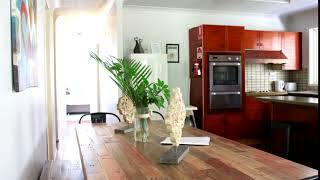 Lorikeet Lodge is a three bedroom apartment containing two king size bedrooms and two bunk beds (sleeps four). 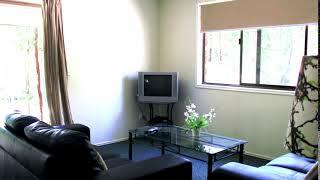 It has a spacious kitchen which is ideal for catering for large numbers. 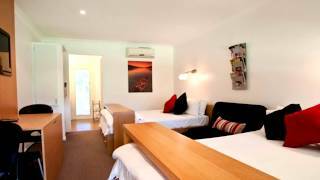 The Bush Lodges are two bedroom lodges and contain a queen bed in the main bedroom and two sets of single bunks in the second bedroom. Ideal family cabins. Brumby Lodge is one of two apartments in The Log House. 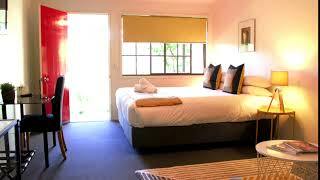 It has three bedrooms, two with king size beds and a single bed in the third. The king size beds can be split. 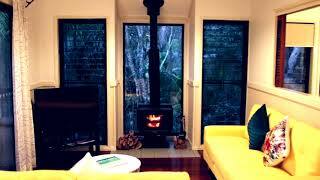 It has a small combustion wood stove and air conditioning in the living spaces and ceiling fans are in all bedrooms. It is fully self-contained. Its décor is inspirational, combining leather settees and antiques with a contemporary flair. 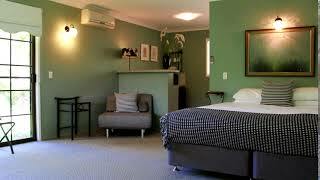 The Chandelier Spa Rooms are spacious rooms situated within the Wallaby Lodge. Enjoying a north easterly aspect, guests wake to golden rays of sunshine and spectacular views of horses grazing in lush paddocks against a backdrop of towering rainforests. The spacious Courtyard Spa Room is an elegant room featuring a king size bed, reverse cycle air conditioning, a two person triangular spa bath as well as a kitchenette with microwave and sink. The Premium Rooms contain two queen size beds, a small two seater settee with pull-out footrest, reverse cycle air conditioning, walk-in shower and a twin basin powder room with Hollywood lights. The Colonial Spa Rooms contain a king size bed, sofa, which can convert to a single bed, reverse cycle air conditioning, a two person oval spa bath with headrest and twin basin powder room. The Executive Rooms contain a queen size bed and king size bed, which can be split into two single beds and a reverse cycle air conditioning. The Heritage Spa Rooms contain a king size bed, Matt Blatt contemporary day bed, reverse cycle air conditioning, a two person oval spa bath with headrests and twin basin powder room.